I cannot see the volume icon in the notification area in my HP desktop running windows XP. How can I get it back? Sounds and Audio Devices Properties Panel is now displayed. From the Volume(tab) - place a checkmark/ tick in the box in front of "Place volume icon in taskbar"
If Sound works, and Speaker icon does not appear in System Tray, please perform the steps given by previous Respondent. If Sound Work, click Start->type Services.msc in Search Window, and Press Enter. Right click on the following Services, and click Restart or Start. Hey it is very simple thing to do, this is not a problem. The thing is only that the notification is not enabled. 1) In the right side of task bar there will be an arrow for the hidden items click on that. Go to "Control Panel" and click on "Notification Area Icons". 2) Now select the "Customize" button. 3) Now in the open windows observe the "sound" icon now under the "Behavior" section select the option "Show icon and notification". 4) After this press on "Ok" button. Now you will be able to see the sound icon in the taskbar. And in control panel click on Sounds and Audio Devices – click double time. After clicking double time, Sounds and Audio Devices Properties Panel is now displayed. 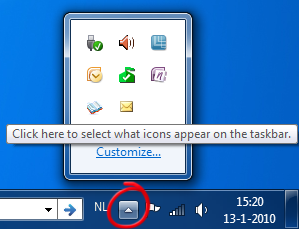 From the Volume (tab) place a tick in the box in front of "Place volume icon in task-bar". 2. In that select show icon and notifications corresponding to volume. Your volume icon appears again.